Today I'm sharing my favourite quilting tools and notions, my personal go to 'must haves' that get used all the time and I would not want to be without. It's quite a long list so go and grab a cup of tea and I'll see you in a moment! First up, the obvious one which isn't in the photograph is my sewing machine. I upgraded my sewing machine last year to a Janome Horizon Memory Craft 8200QC which I LOVE! It's a long arm model which means that the throat space is extra wide, which without question has made machine quilting that bit easier with the extra room provided. I also love the stop/start button feature, which means that I do not use a foot pedal and the auto scissor function..oh my..I honestly squealed when I was shown that in the demo!! I also purchased the extension table, which I would not want to be without. In addition there's a knee lift and copious other features which to be honest I hardly use....but they're there should I want to. HOWEVER.......having a fancy machine is not a prerequisite of being able to to machine piece and quilt. My previous machine was very basic and as long as your machine has a straight stitch and if possible you're able to get different sewing machine feet for it (see notes below), you are good to go!! The three feet I use the most are my Standard Machine Foot, my 1/4" Foot and my Walking (Even Feed) Foot. Last year I got my hands on a Lori Holt Sew Easy Seam guide, which we stock HERE. This is used with my Standard Machine Foot and whilst it can be used for sewing 1/4" seams, I prefer to use my 1/4" Foot as I felt I obtained more accurate results (which I'll talk about in a moment) it can also be used to sew HST, Flying Geese and any other shape that previously required you to draw a line and then sew on top. I absolutely love it and it's this feature that I use it for...it's a HUGE time saver and game changer, which is why it's here on my list! As I mention just now, my go to foot for machine piecing is my 1/4" foot. The Janome 1/4" foot has a little lip that runs against the edge of your fabric, which helps keep your seams accurate. However word of caution, do not take it as gospel that your seam allowance will be 1/4", you must check the position of your needle. My machine has a preset function for machine piecing, which is very convenient, but when I used it I found my seam was a smidge wider than 1/4" so I have to manually adjust it slightly to move the needle over. Yes, it's only by a smidge, but as we all know a smidge off can mean that your overall block can be too small or too big, which is not what you want. Generally, I'm a straight line quilter so I can not live without my Walking Foot (also known as an Even Feed Foot). This foot helps feed the three layers of the quilt (backing fabric/wadding/quilt top) evenly through the machine which helps prevents puckering and makes the job so much easier. Worth every penny if you're considering purchasing one. Two more feet I wouldn't want to be without are my Zipper Foot, makes inserting those zips SO much easier and my Free Motion Quilting Foot. Hands up I don't do that much FMQ, but it's my Achilles heel and I want to get better and this foot helps considerably! Three things that every quilter should have! I personally use Olfa Self Healing Cutting mats, both at home and in the shop. I think you definitely get what you pay for with a cutting mat, in my humble opinion it must be self healing and the surface not too slippery. I would also get the largest mat that you have the room for and can afford. A word of caution, always store them flat, if you prop them up on their side unsupported they will bend and its almost impossible to get them flat again. (Don't ask me how I know!) I also like that Olfa mats have a metric grid on one side and an imperial grid on the other. At home mine measures 24" x 18" at the shop I have the large size which measures 24" x 36". I also use Olfa Rotary cutters. In the shop I have a deluxe cutter, which is great as the blade retracts automatically when I'm not using it. At home I have a standard cutter, which I have to manually retract the blade. Both have 45mm blades and yes they are sharp...VERY sharp. We have been told some absolute horror stories in the shop, so trust me on this one!! I have tried smaller cutters in the past when working on intricate blocks, but for me the 45mm is what I grab and return to for everything. When it comes to rulers I have built up a considerable mix of makes and sizes. In the shop we use Olfa non slip frosted ones which are very good, at home I have my original rulers which I purchased several years ago which are by Creative Grids, they're also non slip. I then have some speciality rulers by EZ Quilting. My favourite rulers are all non slip and I like ones that have black markings not coloured. If you look after your rulers they will last for years which is good as they are an investment. Large Long Ruler, at home it measures 6 1/2" x 24 1/2" the one at work is 6" wide. These are what mum and I use to cut fabric from the bolts in the shop. But at home I use mine to cut my bindings and for subcutting larger pieces of fabric or FQ's without having to move the ruler about too much. Medium Size Long Ruler 3 1/2" x 18", I find this one really useful when I'm subcutting. It's a really manageable size. 12 1/2" Square Ruler, great for squaring off blocks. 6 1/2" Square Ruler, what can I say, I use this all the time, obviously it's great for squaring off blocks, both Lori's Farm Girl Vintage and the Farmers Wife Blocks are 6 1/2" unfinished, so this one has been used lots! I also use it for subcutting and squaring off smaller blocks. My other favourite rulers which I think are nice add on's as and when are my EZ Dresden Ruler and my Lori Holt Circle Rulers (more coming in stock soon), both normally available in the shop HERE. Rulers I've bought and don't use...... I bought a 2 1/2" square and 4 1/2" square. Personally I found I hardly used them, choosing to use my 6 1/2" ruler instead. I'll maybe be brave and get Andy to film me using a ruler so you can see how I hold it! I have various pairs of Fiskers scissors that have done me proud for many years, the pink ones are 'All Purpose' and I have several orange handled ' 5" Needlework pairs'. I also like to have copious amounts of small pretty scissors about, so there is always a pair to hand, however pretty they may be but they must be sharp, there's nothing more annoying when you go to snip a thread and it doesn't cut. I also have a good quality seam ripper by Clover, it's bad enough when the occasion arises which necessitate the use of one, so make life easier and use a good one that does the job quickly and efficiently! My go to pins for machine piecing are either my Clover Flowerhead Pins or my Merchant and Mills Entomology Pins. Both are extremely fine and long and I use them when joining long rows of patchwork together to get neat matching seams. For applique, I use my tiny Clover Applique Pins. Due to their size I find that my thread doesn't get tangled when I'm stitching near them, I also find that pricking my fingers is avoided. Edited Jan 18, I have been sewing more and more with Liberty Tana Lawn and have found that Tulip Applique pins are perfect for the lawn, nice and short and slightly thinner. Whilst on the subject of applique, a chopstick is a great tool for turning through when using the interfacing method (I'll be covering that in more depth as part of the A Little Happy Sew Along in the next week or so). I also couldn't live without my 1/4" Clover Bias Maker...such fab tool, available HERE for making my applique flower stems. I adore my Clover Black Gold needles, they glide through fabric like nothing else I've ever used, however the downside is that the eye is rather tiny. Edited Sept 17 I've recently been trying out lots of different needle and have very successful results with 12wt thread and Clover Gold Eye Embroidery Needles....look out for a new Blog post on this subject soon! Whilst talking about needles I must also mention thimbles. Historically, I have never been able to wear a thimble, I have found them cumber-sum and uncomfortable.......that all changed recently with the discovery of Prym's Ergonomic Thimble, I can't tell you had good this is. I even forget I'm wearing it. Find them HERE. For marking straight quilting lines, I ALWAYS use a Clover Hera Marker, which basically leaves a crease mark for you to follow. Such a great tool, can't recommend it enough! The eagle eyed will also have seen a Frixion marker. I do find Frixion pens useful for marking, but ONLY when, under no circumstances, is there any chance of the pen lines being visible in a finished project. The reason for this is whilst the lines magically disappear when ironed, there is also the possibility that they may reappear when the item you've used it on becomes cold. So use with extreme caution. All my favourite Pins, Needles and Notions can be found HERE. It's no secret that my thread of choice for almost everything is Aurifil. Having been sewing for years and used lots of different threads, both cheap and expensive, I can honestly say that Aurifil is my favourite both in terms of quality and the range of colours and weights available. I use 50wt for machine piecing (you will not believe how long your bobbin lasts), English paper piecing, Applique and quilting. The thread is so lovely and fine it just beds in to your seams, which also helps reduce the bulk. I also use 40wt for quilting when you want to showcase your stitches, I used it recently on my Mendocino Quilt. Possibly my favourite is 12wt for hand quilting and embroidery, I LOVE this thread. There is also Lana wool in 12wt, which is a dream for using with woolfelt and Aurifloss, a 6 stranded thread for embroidery. I am also very excited to try the new 80wt, launching in the UK later this year! Our Aurifil thread selection is available HERE. I am a huge fan of Mary Ellen's Best Press, a clear starch alternative. Its great for getting those stubborn creases out of fabric and a spritz when pressing your blocks helps the seams to lay flat. It has a gentle feel to though, don't think of rigid stiff fabrics, its nothing like that. Somewhat controversial I also love 505 spray and use nothing else when basting smaller projects, I have been known to also baste a quilt or two with it ( I know sharp intake of breath) don't judge! Both of these are available in our bricks and mortar shop, but not online due to fear of leakage..sorry! My final potion lotion would be my Sewline Glue Pen which I use for English Paper Piecing....its true I'm convert (most of the time) to glue basting. One of my favourite applique tools and one I wouldn't want to be without, are my Clover Bias Makers. I have two, a 1/4" on and a 1/2" one. Both are brilliant for making flower stems or narrow strips ready to be appliqued. Available HERE. I have lots of needle books and pin cushions, I like to have several so I can keep one with each project I have on the go. They are also extremely satisfying to make! I am also slightly obsessed with tins, I can not resist a pretty one.....I use tins to store my threads, a different one for each weight. They're also great for keeping small WIPs in, I can easily just grab one and go! My final must have is a small tray or two, so good for keeping everything together when I'm sewing on an evening. So I think that's pretty much all my favourites covered, I hope that you have found it useful. Please do by all means feel free to share your favourite tools and notions in the comments below....I would love to know what you find useful or would like us to stock! A word about Frixion pens. I live in a part of Canada, where it does get very cold. I use fine tipped Frixion pens to trace embroidery designs. The lines have never returned. Thank you Sarah for taking the time to provide your favourite notions & tools, as a beginner I have found this very interesting & helpful. 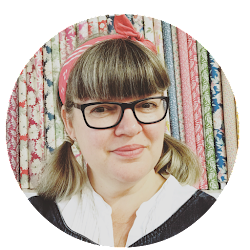 Hello, my name is Sarah, I'm a mum, wife, purveyor of pretty fabrics and trims, fabric addict, quilter, happy stitcher and home maker. This blog is all about my hopes and dreams for my family and our family business..... it's a little happy place! If you wish to feature my pictures, brilliant!! ....but please do be considerate and ensure that my copyrighted material is credited to me as 'A little happy place', and linked back to me. I would ask that you please do not reprint my writing without asking me first for permission and finally and in no uncertain terms, using pictures of my children is strictly prohibited! Thank you for your understanding.